Thank you for your interest in our CSA membership. We are now accepting registration for our 2019 CSA Season! Please read the information below before signing up. Some things have changed. We encourage even returning members to read this page. It includes everything that was previously in our registration package. We are now adding Alliston and Creemore to our Wednesday pick-up options! We can now accommodate CSA payment by Credit Card! Once you have finished reading, visit our CSA REGISTRATION page to sign up! Join our MAILING LIST to find out all our farm news: CSA sign-up, on-farm seedling sales, pasture-raised organic chicken and pork sales later in the season and Winter CSA membership. The CSA model is a mutually beneficial arrangement between producers and consumers. It allows people to become members of a farm and in so doing, engage in their agricultural community. After growing vegetables in partnership with CSA members for 10 years, we recognize the importance of this arrangement both financially and socially in building a sustainable and local agriculture. It is unlikely that we would be farming today if it were not for the Community Supported Agriculture model. The up-front investment made by our members each year has been critical to the development of our farm. By becoming a CSA member, you share in the bounty of our farm! 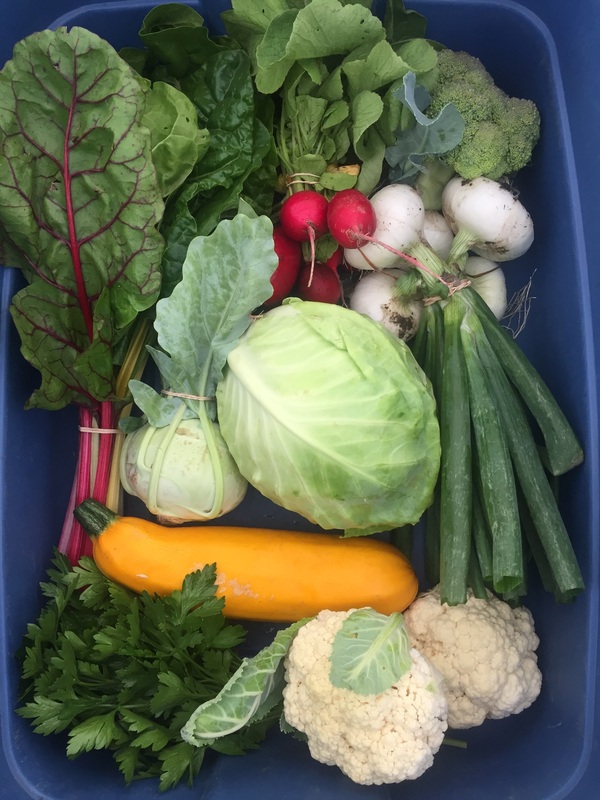 CSA members pick up a selection of in-season, fresh, organic vegetables from our farm or at drop-off locations every week from approximately mid-June to the end of October. Regular communication with the farmers allows CSA members to learn about our farming practices and to develop a deeper connection to where your food is coming from. WHAT WILL BE IN MY CSA SHARE? 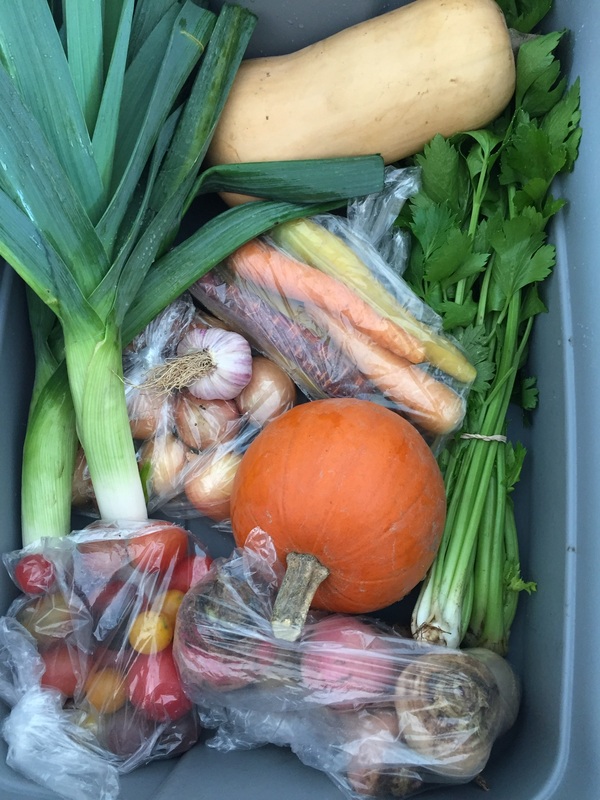 A typical share consists of 6-9 items that vary by the week and by the season. Staple crops include greens such as lettuce, spinach, chard, kale; herbs, potatoes, carrots, tomatoes, squash, cucumbers, beets, cabbage and onions. Below is a list of our current pick-up options. If you know of a place in our area that would like to host a pick-up (minimum 10 shares signed up) we would love to hear from you! Our CSA will run for approximately 20 weeks, beginning on the 3rd week in June and ending the last week in October. These dates are approximate, depending on the weather and the season. If you know that you will be away, we ask that you arrange with family or friends to pick up your share, or you can donate it to our Community Share. Or, consider a “Getaway Share” that allows you to pre-arrange to skip two weeks any time in the season. Farms incur most of their costs at the beginning of the season. The CSA model was developed to help alleviate financial pressure on farmers by sharing their costs at the beginning of the growing season when money is needed the most. An instalment option is provided to break up your costs if necessary; however, we encourage you to pay the full amount as soon as possible. Payment can either be made in full by cash, cheque, electronic money transfer, by credit card or by post-dated cheques. In the spirit of making our food more accessible, we are happy to provide alternative payment options to anyone who would like to become a CSA member. Please be in touch to let us know what alternate payment schedule would work for you. How many people does a small share feed? That depends on how you eat! We hope that the photos above will help. A Small Share generally feeds two people who cook less often, small/young families, or a single who cooks a lot. A Large Share generally feeds two people who cook a lot and families of four or more. The Large Share often includes double the quantity of the same items, but sometimes we include a greater diversity of items instead. Consider buying a Large Share if you would like to preserve vegetables (freeze, can, dry, make soups, etc.) for the winter. Full Greens Share – $285, Half Greens Share – $155 – VERY POPULAR! If you or your family enjoy eating a lot of greens, we recommend signing up for a Greens Share. In exchange for allowing us to plant, grow and harvest greens more efficiently, you pay less for these greens than you would at our market table. This can be a nice complement to a regular vegetable share or enjoyed all on its own! A Full Greens Share will cost $285 and will include an average of 1 lb. of greens per week, including lettuce mix, head lettuce, mesclun mix, spinach, arugula, mustard mix, kale and more. A Half Greens Share for $155 consists of 1/2 lb. of greens each week. The Greens Share will be offered for the same duration as the regular summer shares (20 weeks). If you are signing up for a bi-weekly share, please be in touch to specify if you will come for your greens in your off-week or receive twice the quantity on a bi-weekly basis. There are times throughout the season when the garden is particularly generous! If you are interested in doing some preserving to enjoy the summer’s bounty during the winter months, we will be all too happy to help you out with this! When there is a bounty, we will add extra quantities of items well-suited to being frozen in your weekly share. We expect to include: beans, peas, broccoli, cauliflower, spinach, swiss chard, kale, sweet peppers, tomatoes and basil. We recently invested in small moveable hoop houses (caterpillar tunnels) which we are hoping will increase our production of sweet peppers, tomatoes and basil. For the 2019 season, we are offering a small number of work shares. By committing to 10 hours of work on the farm, you can reduce the cost of your share by $100. The Work Share provides an opportunity for learning and involvement in our team. Working times must be scheduled ahead of time for Tuesdays-Fridays between 8am – 5pm. Scheduling can be flexible. Last year, the Community Share Fund was able to subsidize two CSA shares for members of our community who needed some financial support (through the Family Transition Place and Shelburne Food Bank programs). We are hoping to raise more funds to provide more subsidized shares this season. We believe that nutritious and locally grown produce should be accessible to all members of our community. While this fund will by no means reach all those in need, we would like to do what we can. If you would like to support this effort, please add your contribution to the total on your membership application. Consider that a small share costs roughly $25/week, any small amount that you can contribute is greatly appreciated. We offer shares of storage and root vegetables during November, December, January and February and hope to further develop this part of our business. Crops include potatoes, carrots, parsnips, beets, turnips, rutabagas, onions, celeriac, leeks, garlic and cabbage and greens. Winter Share sign-up details will be provided later in the fall. If you would like to discuss particular or regular volunteer arrangements or if you have particular interests, please let us know. Throughout the season, we will communicate a number of volunteer opportunities to our CSA members. This is by no means mandatory, but is simply an option for those CSA members who would like to develop a closer connection to the farmers and the farm that is producing their food. We feel this is an important way to continue the get-to-know-you process and tighten the gap between producers and consumers. CSA members are most welcome to visit the farm to experience the farm first-hand – in fact, we encourage it! Please call ahead and understand that if we are busy, your tour may be self-guided! Communication throughout the season with CSA members will be by email, through this website and our FACEBOOK page where we will post newsletters, recipes, volunteer opportunities, upcoming events and photos on our homepage. You will automatically be added to our Mailing List to find out what’s happening at the farm. There is also an option on the right-hand sidebar to Follow Our News. This means that you will automatically receive email notification if we add something new to the blog / homepage. WHY DO WE NEED CSA? Our current food system gives us all cause for concern. Our food is trucked in from thousands of miles away. We do not know the farmer who grew the food or the practices they may have used. CSA seeks to address these concerns. Members help farmers earn a decent, reliable income while supporting local, organic food and sustainable farming. You want to eat locally and in season. You care about what you eat, where it comes from, and how it’s grown. You want to develop connections to the people and land that grow your food. In the CSA arrangement, members share in the risks of farming. For example, if a particular crop is affected by weather or pests, member shares may be smaller or less diverse. However, if the year is good and there is a bumper crop, members reap the rewards! This allows farmers to focus on doing what they do best: growing delicious organic food. 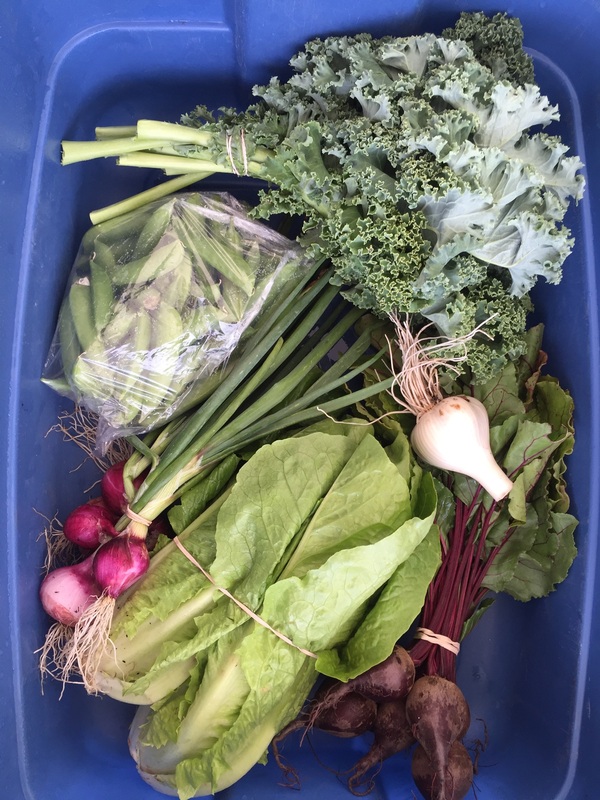 SIGN-UP for our CSA today!